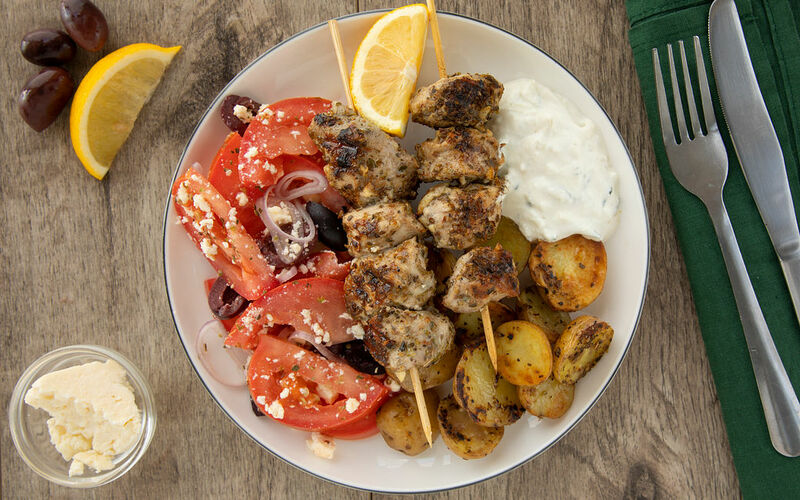 Sail away on a delicious journey to Greek flavours and swim in an ocean of fresh and mesmerizing aromas with this fantastic pork souvlaki! Preheat BBQ (medium-high heat) or oven (400°F). 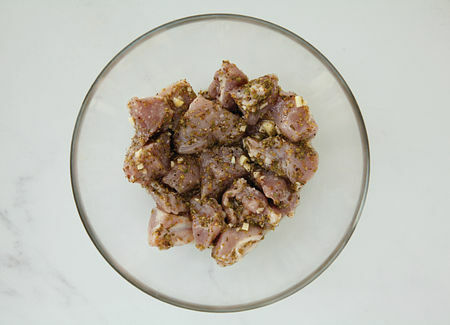 Mince the garlic and place ½ in a bowl with the pork cubes, the juice of ½ the lemon, 1/3 the olive oil, 1/3 of the oregano and salt and pepper to taste. Toss to combine and set aside for 10 min. Cut potatoes into wedges and toss in a bowl with 1/3 of the oregano, the remaining garlic, 1/3 of the olive oil and salt and pepper to taste. 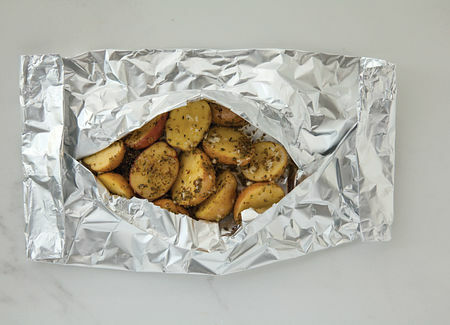 Arrange on a large piece of aluminium foil and add 1 tbsp of butter on top. Form a closed packet, making sure the steam won’t escape while cooking. Cook on the BBQ or in the oven for 20 min, flipping it over every 5 min. Thread the pork cubes onto skewers. 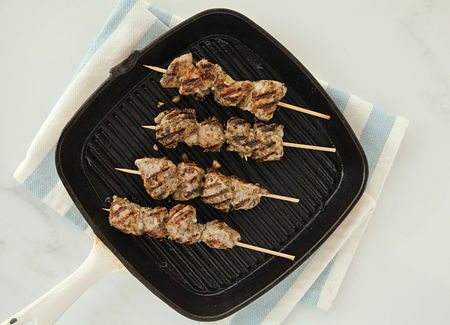 Grill the skewers on the BBQ or in a grill pan. Turn every few minutes to brown all sides, for 10-15 min or until the pork cubes are no longer pink in the center. 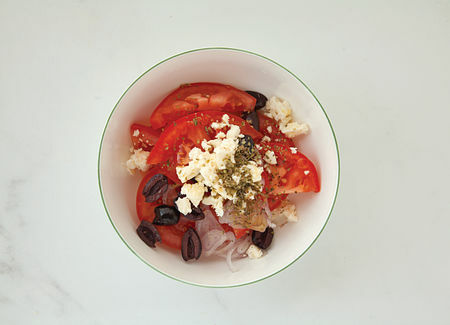 Cut the tomato and the feta into cubes. Halve the olives. Finely slice the french shallot. Toss ingredients in a bowl with remaining olive oil, remaining oregano and the juice from the remaining lemon. Season with salt and pepper to taste. 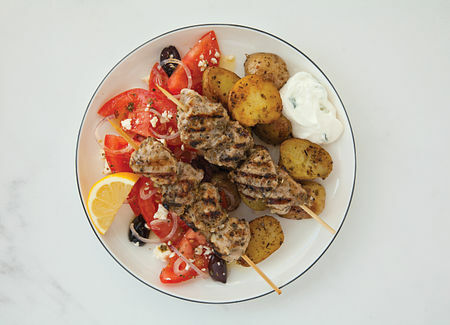 Serve the skewers with the potatoes and salad. 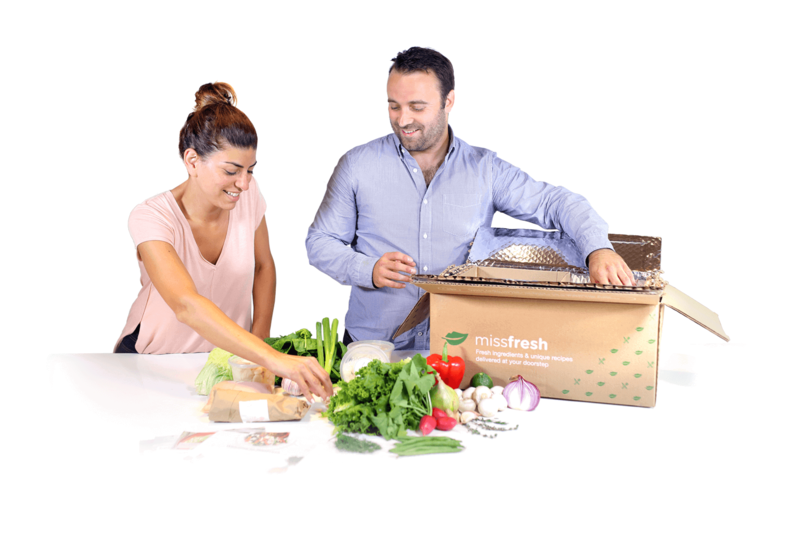 Accompany with tzatziki. Enjoy!